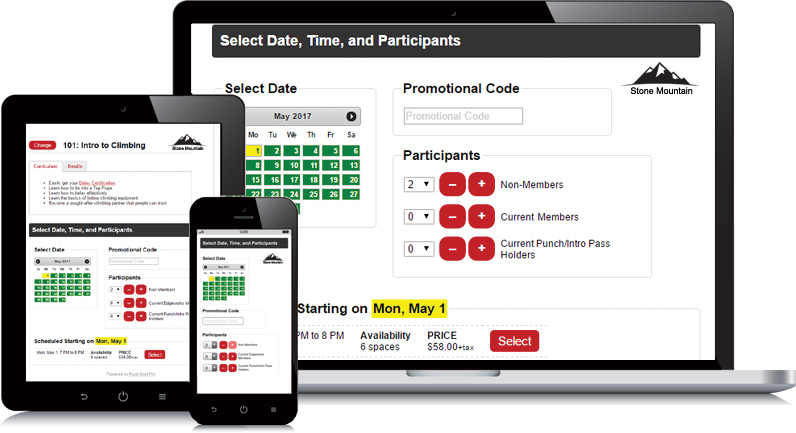 Rock Gym Pro’s intuitive interface allows your staff to easily manage new and recurring members and guests. Manage member payment information, member type, member status, add notes to profiles and more. 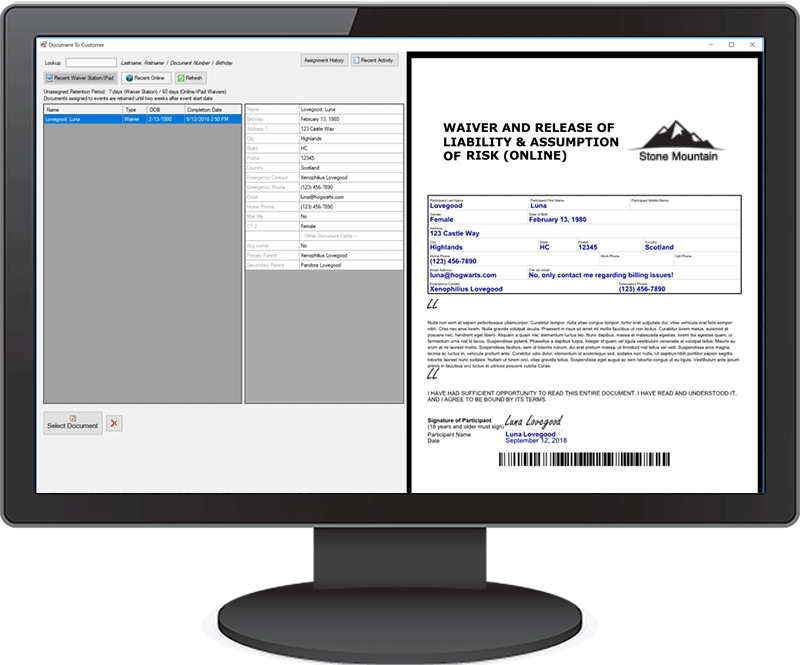 Create digital waivers, contracts and other documents for your customers to sign. Signed documents are attached to the customer record with the RGP integrated digital document system. Give your members the ability to request changes to their membership account directly from your website. Bill all of your monthly members in just a few clicks. Members are automatically notified of past due balances and can easily update payment information directly from your website. 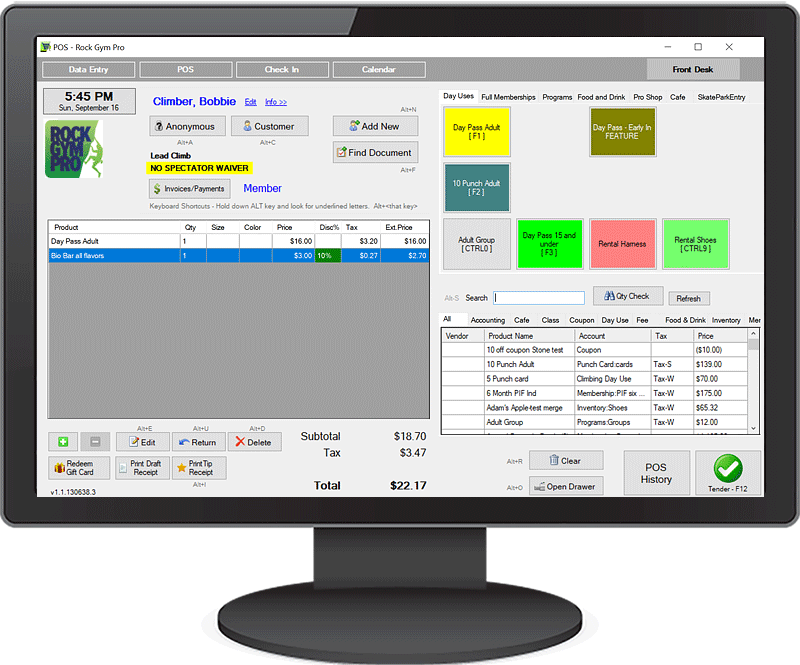 Reprint receipts, generate Z-Out and POS history reports and easily track/update product inventory – all from the POS screen. Use the FREE Smartwaiver + RGP integration so your participants can complete a paperless digital waiver, online and at your facility. Once signed, the digital document AND customer information is automatically transferred to your Rock Gym Pro database. Your front desk staff will receive visible and audible alerts when a new or existing customer comes into your gym without a signed waiver, or when waivers have expired at age-of-majority or pre-set waiver expiration dates. All signed waivers will be automatically assigned to the appropriate customer record in Rock Gym Pro to avoid duplicate customer records. Use membership barcoded key tags, the RGPro Connect mobile app, or simply search by last name to get your members and guests checked in quickly. Your front desk will notice visible and audible alerts when members need attention (e.g., past due, expired memberships, no waivers, impending membership status changes etc.). Easily insert RGP web widgets into your website so that customers can view your updated schedule, pay for classes/events/memberships and create online booking profiles – all without leaving your site. RGP web widgets maintain the look and feel of your website. Display your up-to-date calendar of events and classes. Allow customers to create online booking profiles and store their credit cards for faster repeat bookings. Sell memberships, punch cards and gift cards online. Send confirmation emails directly from RGP. Sync 3rd-party iCal feeds to your RGP calendar. Your customers can download the free RGPro Connect mobile app from iTunes or Google Play and book classes directly in the app from their online account or stored credit card. With RGPro Connect, customers can also check in with a digital barcode (instead of a key tag) from their mobile device. 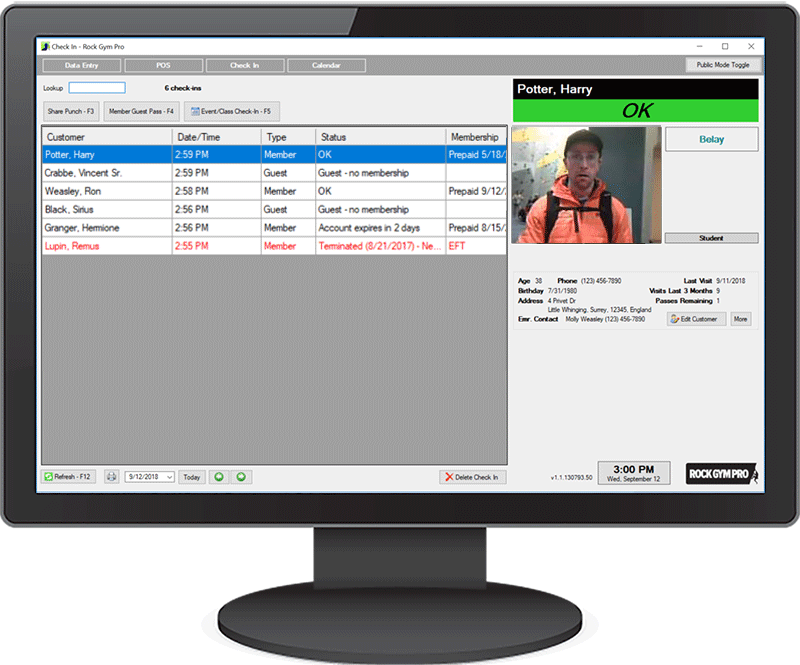 If you’re responsible for more than one facility you can easily link the databases of remote facilities together to offer a seamless member check-in. With RGP’s multi-location functionality, your staff members will be able to manage customer records at any linked location. 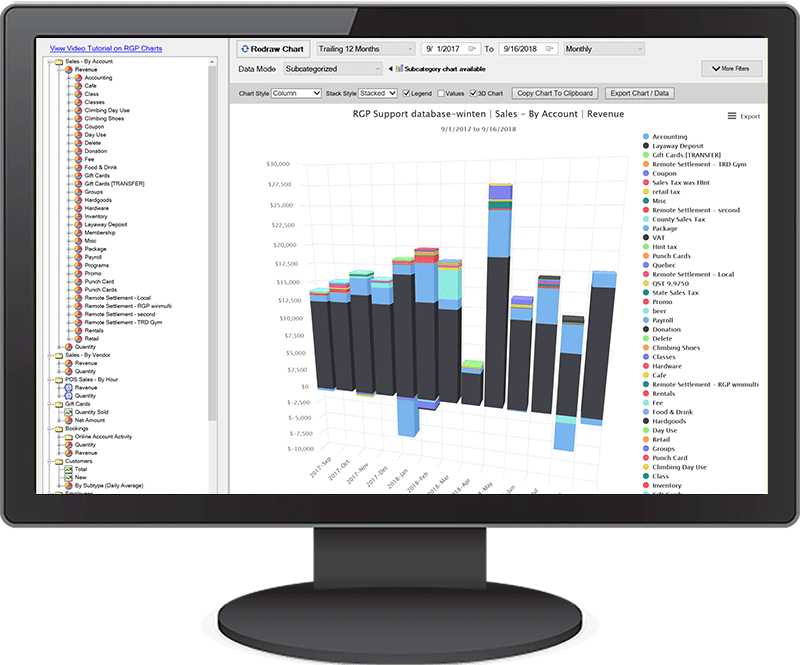 RGP provides powerful reporting and analysis tools that help you make better business decisions for your facility. Create customer reports and have summaries emailed to you each day, week or month. Know who your most loyal members and guests are, what they’re buying and how often they visit with detailed reports that display purchase and check-in history. Create easy-to-read graphs that measure how well you’re retaining those members. Keep track of inventory levels and never run out of your best selling products with RGP inventory management reports. View real-time sales and check-in data, even when you’re not at the gym. 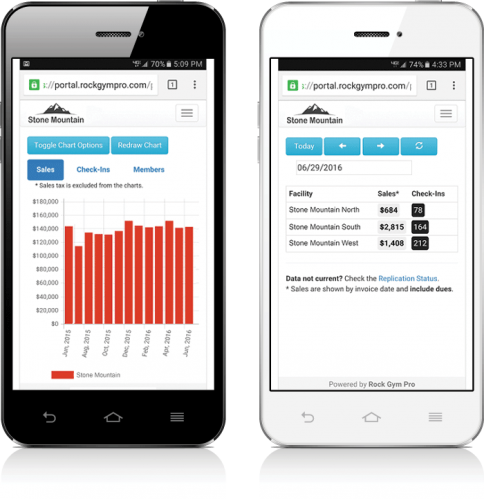 With RGP’s Mobile Dashboard you can monitor your business from your mobile device or computer from anywhere. If you have multiple locations, the Dashboard will consolidate all of your metrics into one convenient place. can help your high-volume facility.